Here are the official results from the voting at yesterday's SB 798 hearing before the Committee on Public Safety. 1) They didn't understand the bill and were just voting along party lines like sheep. 2) They did understand the bill and just didn't care about all the negative impacts it would have had on California, including the state's already-poor economy. 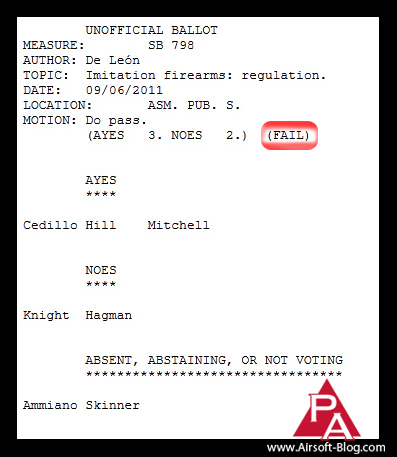 Assemblymembers Knight and Hagman have been voting no on SB 798 for quite some time now. What actually put us over the top for the win, in terms of votes, was the fact that Assemblymembers Ammiano & Skinner did not vote. Normally, in the past, I believe they've voted in yes, which in this case, was a bad thing. So there you go. Just a little more of an SB 798 update for you.